"You can’t play with them, and you can’t play without them. The smallest piece of required equipment may be perhaps the most instrumental in preventing serious injuries on the ice. Still, watch any game at any level of hockey and you’re almost guaranteed to see a player improperly wearing his or her mouth guard. Players chew on them like a pacifier or let them hang from the string on their facemask like fuzzy dice from a car’s rearview mirror. The USA Hockey Rule Book plainly states that all players, including Peewee through Midget and Girls 8 & Under through 19 & Under, are required to wear a mouthpiece that covers all the remaining teeth of one jaw. Players know the rule, and so do their parents and coaches. Officials, the last line of rule enforcement, know the rule better than anybody. So then why aren’t mouth guards in the mouths of USA Hockey players? “Referees can certainly be more proactive in enforcing the rule, but they can’t be running around looking for [mouth guard infractions] because they will miss something else,” says Matt Leaf, director of the officiating education program for USA Hockey. A player who doesn’t wear a mouth guard is not only putting him or herself at risk, they’re also jeopardizing their team by taking a penalty. Knowing the consequences of not wearing one, says Mark Tabrum, director of the coaching education program for USA Hockey, should have enough impact on a player to properly wear a mouth guard. Parents, who sit in the stands or circle the glass at ice level watching every move their son or daughter makes on the ice, should be the first ones to act, stressing the safety factors, and potential visits to their dentist, as a cause to wear one. Still the question remains, why can’t players stand wearing a mouth guard? Most players argue that the protective pieces are uncomfortable, inhibit breathing and prevent them from communicating with teammates. “Communication is such a huge part of the game, especially to call for the puck or direct instruction toward a teammate,” says Chris Essey, a defenseman with The Ohio State University’s club team of the American Collegiate Hockey Association. Essey, who uses a “boil and bite” mouth guard, says he usually stashes it in his glove during games, just in case an official warns him for not wearing one. Boil and bite guards are immersed in hot water and then formed in the mouth through a biting impression. There are also stock mouth guards, which are available in standard sizes and are simply removed from the package and placed in the mouth. While the majority of players may use some form of a store-bought mouth guard, USA Hockey medical personnel strongly recommend that players wear a custom mouth guard fitted by a dentist. “A custom mouth guard stays in the mouth,” says Dr. Alan Ashare, chairman of USA Hockey’s Safety and Protective Equipment Committee. “With a boil and bite, you have to keep your mouth closed to keep it in, and breathing will be restricted because it is a loose fit. It also makes it difficult to communicate. 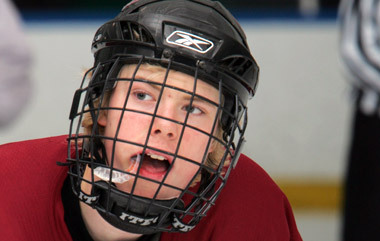 That’s one feature of the custom mouth guard that drove high school player Chris Coyle away from wearing one. Coyle recently tried a custom mouthpiece but didn’t like the feel because it “fit too well and was too secure” around his teeth. He went back to the boil and bite mouth guards he is used to wearing, and has never had a problem with communicating or breathing. The main benefit of wearing a custom-fitted mouth guard is it protects teeth and nearly eliminates the risk of tooth loss. It also protects against lip, mouth and tongue lacerations as well as reduces the risk of a jaw fracture. A potential injury to the mouth or jaw is one reason why Coyle always wears his mouthpiece. “Every now and then you will get a stick to the mouth, even with the cage,” says Coyle, who plays for Padua High School in Parma, Ohio. There is no evidence that proves wearing a mouth guard will prevent a concussion, but USA Hockey’s Chief Medical Officer Dr. Michael Stuart says it is a “very necessary” research project that he would like to pursue. “A custom mouth guard may be another piece of the puzzle to help reduce the risk of a concussion,” Stuart says. There are new guards, Stuart explained, that feature impenetrable bite plates that are designed to re-align the jaw. Wearing a mouth guard can potentially protect players from multiple injuries, but the bottom line is that it won’t do any good if it’s not properly fitted and worn. “If we educate our athletes of the merits of a custom-made mouth guard and refute many of the reasons for not wearing one, there will be more compliance,” Stuart says.